Live Updating: A live-updating article, such as a liveblog. Featured: An article a publisher has told us is standout. Fact-check: An article providing fact-check content about the story. Your Preferred source: An article from a source that you preferred. Evaluating a story from different angles often provides a sharper perspective. 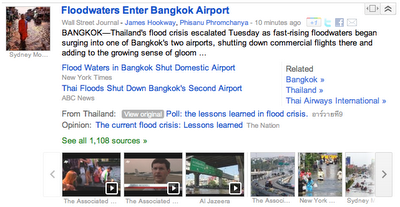 That is why we also now highlight special types of articles in many Google News search results. Your search results will not only show recent articles, but also those from diverse perspectives that relate to a given query. We also recently added the Translate button to non-English international stories in expandable story boxes in the U.S edition, giving you the ability to read pieces from all over the world -- even if you don’t speak the language. We hope you find these changes useful as we continue to develop opportunities for you to find more interesting and valuable content. 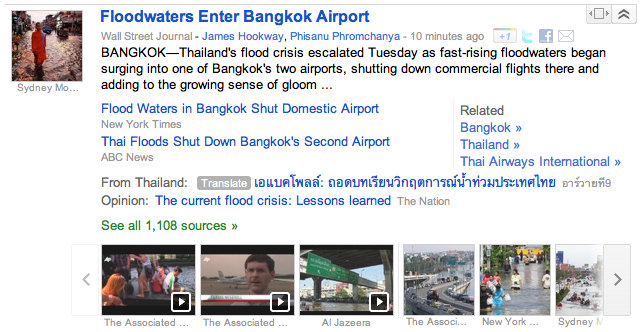 This entry was posted in Google News Blog and tagged Google News on October 28, 2011 by Unknown. We're excited to bring you this additional level of control and encourage you to give it a whirl. To help bridge language barriers between you and the news of interest to you from around the world -- and to bring you more diverse perspectives on foreign events -- we’ve added a new “translate” button to the expandable story boxes in the U.S. English edition of Google News. Clicking the translate button reveals the English translation of the original headline using Google Translate. Clicking on the headline takes you to the publisher’s website where you can choose to use Google Translate to see an English version of the entire article. Headlines are labeled with their country of origin. To do this, we look for foreign articles from local sources on a relevant news topic. For example, in the case of the flood in Thailand, in addition to surfacing English articles from international press like New York Times, we might show a related article from a local source like อาร์วายที9. At the same time, we hope readers will benefit from finding relevant news in other languages and being able to read it without knowing the language. 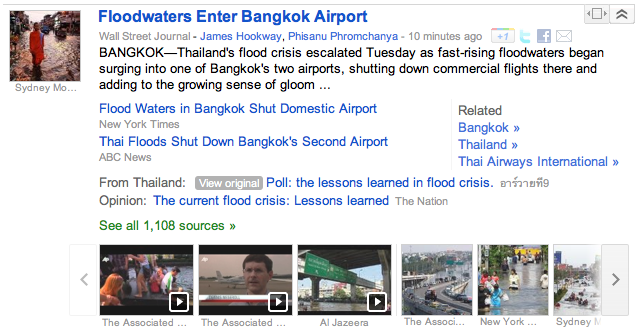 This entry was posted in Google News Blog and tagged Google News on October 25, 2011 by Google News Blog. This entry was posted in Google Web Fonts Blog and tagged Fonts, kickstarter, new fonts, Web Fonts on October 25, 2011 by Dave Crossland. Halloween is here - what a fun time of year! The pumpkins are carved and the seeds are roasting in the oven, a chill is in the air, and all the little monsters are busy planning their best tricks and hoping for excellent treats. With all the trick or treating & costume planning, why not add some Halloween spirit to your website as well? We're happy to publish 4 new, fun, and scary fonts this week that are sure to provide a spoooooky feel for your website! 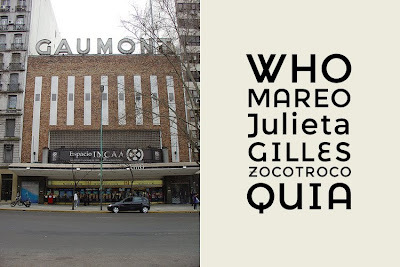 We would love to see how creative you can get with these fonts - please let us know where you are using them in the comments of this post, and we'll send out a Google Web Fonts T-shirt for our favorite! Its ghastly! Its gory! Its gruesomely gleeful! It's Creepster, the blood-curdling new font from Squid and Sideshow. This fright-filled font has so many alternates its like stitching together your own monster every time you use it. Creepster: perfect for all of your grisly graphic needs! Eater is a display font infected by the darkest of rare disease that slowly spreads at night while the webfont user sleeps. Nobody knows where Nosifer comes from. It emanates a dark stench as it drips from the internet. Butcherman is a zombified display font, hacked and chopped and left for dead, yet still crawling! This entry was posted in Google Web Fonts Blog and tagged Fonts, halloween, new fonts, Web Fonts on October 24, 2011 by Dave Crossland. Many Custom Search users also regularly use Webmaster Tools. To make their lives more convenient, we’ve added a “Custom Search” feature to the Labs section of Webmaster Tools. This allows you to change your basic configuration, including the list of sites to search, and get the new code without leaving Webmaster Tools. For users who have never created a Custom Search Engine, it helps you get started by automatically creating a default CSE that searches the current site selected in Webmaster Tools. We hope these new features make it easier for you to provide a great search experience for visitors to your site. And as always, we welcome your feedback. This entry was posted in Custom Search Blog and tagged Google Custom Search, Search on October 12, 2011 by Custom Search Team.